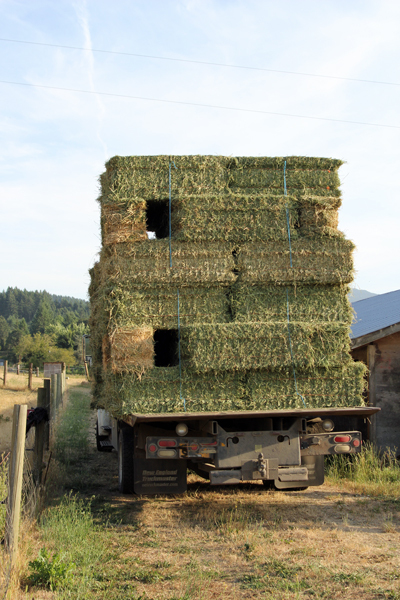 Summertime is the time to find hay and get it stored for the winter. Our Plan A fell through and we had to scramble last week to come up with a Plan B. 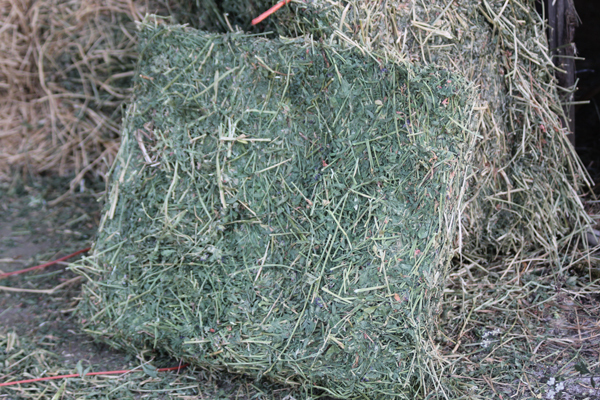 We usually feed a combination of Orchard hay and Alfalfa or just Orchard hay depending on what is available and the cost. We were originally going to go with a nice blend this year, but plans change and we are going with straight Alfalfa along with a few tons of a local grass hay. 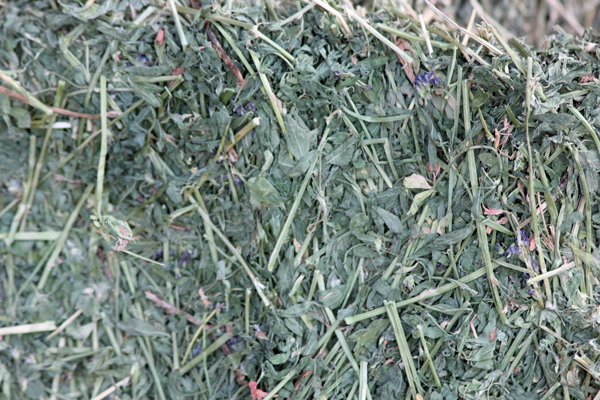 The Alfalfa we found is from the other side of the state and it was delivered on a semi. It is from DeLeon Farms and the fields are absolutely beautiful! I am delighted with their customer service and the fact they were able to help us with such short notice. 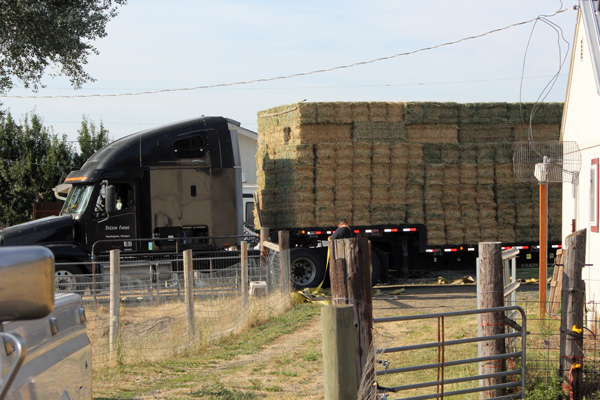 When you have hay delivered on a semi, you need to have a squeeze available to unload the hay. 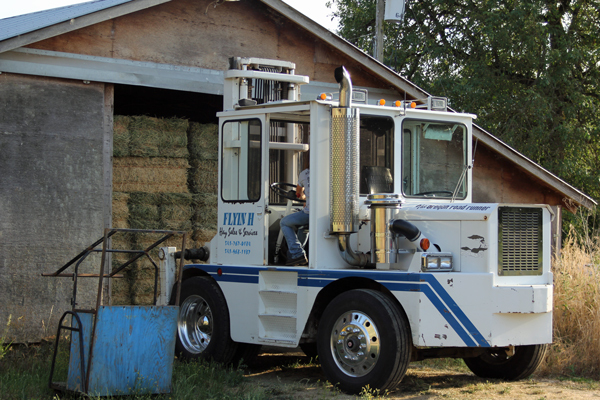 Kris from Flyin’ H Hay did a fabulous job unloading the hay and putting it in the barn. Unfortunately, the squeeze was just a little too tall to go ‘in’ the barn. We will need to move it down to the other end of the barn, but it is nice that it is under cover just in case it rains. We only needed 8 tons, so I called a few friends and lined up people for the rest of the alfalfa. My brother took 6 tons and his help unloading the hay and counting bales and sorting out who got what was invaluable. Splitting up 24 tons between 6 people took a little bit of work. After unloading the hay up, it was time to feed the sheep. I was extemely happy when I opened a bale. There is a lot of leaf, fine stems, and no dust. Luckily the sheep were very happy with it too! A bunch of happy customers! With straight alfalfa we won’t feed grain. When we just feed orchard hay, we feed field peas. They are high in protein and do a good job. 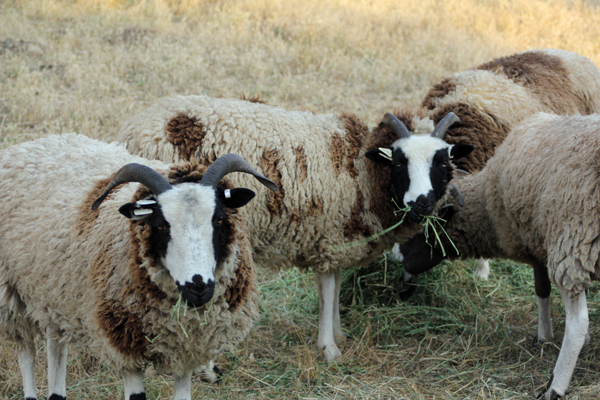 I prefer to not feed grain, the sheep get too pushy! Love the hay squeeze… I am drooling over the “hay grabbers” that attach to skid steers…. But for now, it is by hand…one bale at a time…. Thankfully we only get about 40 Ton in Small Squares!